When will Amazon.com offer their customers banking services? If this question isn’t keeping the executives at Big Bank up at night, it’s because they haven’t been thinking in terms of ecosystem strategy. We live in a world of ecosystems – from natural ecosystems that make up our living planet, to business, institutional, and societal ecosystems that affect our well-being – as individuals and communities. Let’s begin by defining what we mean by business ecosystems. An economic community supported by a foundation of interacting organizations and individuals—the organisms of the business world. The economic community produces goods and services of value to customers, who are themselves members of the ecosystem. The member organisms also include suppliers, lead producers, competitors, and other stakeholders. Over time, they coevolve their capabilities and roles, and tend to align themselves with the directions set by one or more central companies. Those companies holding leadership roles may change over time, but the function of ecosystem leader is valued by the community because it enables members to move toward shared visions to align their investments, and to find mutually supportive roles. Too be clear, in the business-world the term ecosystem is often defined in a reductionist way to include products, services, and businesses that work together to deliver value to the customer. While it is critical to developing your business offerings, it falls short in understanding the dynamic nature of markets and society. The problem with a narrow view of ecosystems is that we miss the larger story. Peter Drucker said that “business has only two functions — marketing and innovation.” Marketing and innovation have one thing in common – satisfying the unmet needs of the customer. The customer, thus, is at the heart of ecosystem thinking. And the customer lies outside the business. It turns out that most of the good ideas in your industry are also outside your business. The marketplace of ideas is not a closed system, but one that is continuously evolving, with thoughts, suggestions, rants and raves. Markets, someone once said, are conversations. Who is the customer, really? Philip Kotler, the father of modern marketing, reminds leaders to look beyond “shareholder value” and focus on “stakeholder value.” All too often business forgets that the customer is not just the individual or business buying your product. The customer may also be the local community, the state, the country, and society itself. To us, the term ecosystem implies systems thinking, which means we must look at understanding the interdependent structures and participants in dynamic systems, and their effects on one another and society over time. It is the category that you compete in. It’s also your reputation. Ecosystem Strategy, like traditional strategy, is about choices and decisions. The difference? 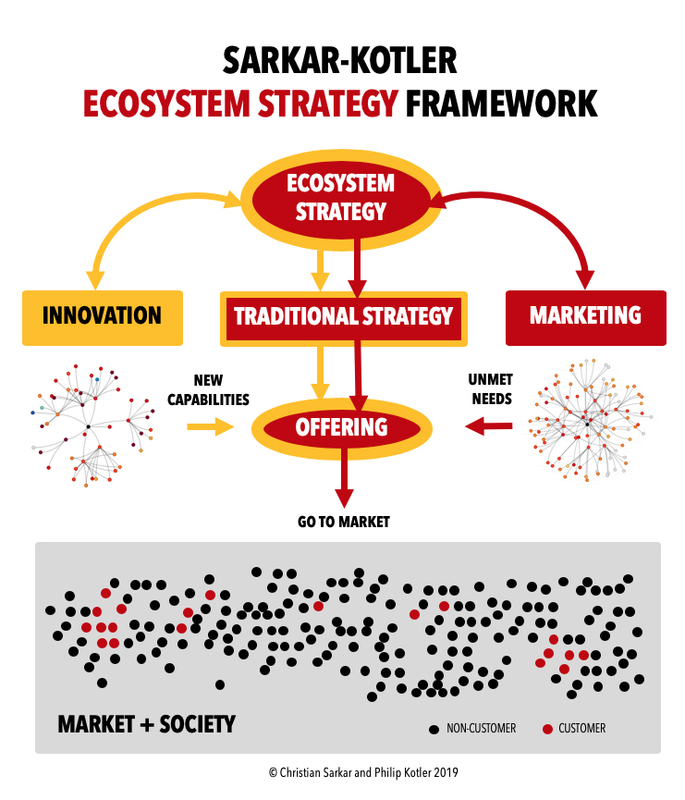 Ecosystem strategy considers a broader sphere of influence and is based on dynamic intent and action of the participants. It impacts traditional strategic frameworks in significant ways. What is our purpose in the ecosystem? What’s the job to be done? Where’s the value for us, for our partners, for our customers, for society? Where will we play? What ecosystem segments should we pursue? What are our ecosystem 4Ps? Where do we stand? Who is the competition? How do we plan to disrupt/impact the existing ecosystem? Where will we innovate? Category, Idea/concept, Capabilities, Geography, Industry, Customer segments? Will the ecosystem accept or reject our offering? What is the zeitgeist? What will we do to deliver? How visible do we need to be? Your strategy depends on your goals. The point is to match your strategy to the structure of the ecosystem you are competing in. Ecosystem Analysis: What Are We Looking For? Ecosystem Marketing – What is it?